I am so excited to announce that today I received two Kodak PlaySport Waterproof HD Digital Video Cameras. These were provided to me for use at the Roger Williams Paddle that will be taking place July 17th in Providence, RI. I’ll be using those cameras along with my XShot Kayak mounts too. I am very very excited about using these cameras. Not only do they do 720p video but they also take 5MP stills as well. That is great when I am kayaking and instead of taking out a second camera to take stills I can capture them with the digital video camera. This will be so much fun. So far I’ve only taken them out of the box, read the instruction books, set the date and started charging them. So yeah I guess I have done a bit already. I will be practicing with them so that I am ready to use them to record an interview with Jennifer Cisney from Kodak (@KodakCB). She is going to be at Evo’10 Conference. We’ll be talking about the PlaySport and the upcoming Kayak trip. I’ll be talking about these cameras often so know that I received them free of charge and all opinions expressed are mine alone including my impressions while using them. I’ll also be making videos with these cameras and so look for this graphic at the end of each video. Also take a look at KODAK online and connect with the great people in KODAK Social Media (Kodak on Facebook, @Kodak Events and @KodakCB). So, thank you Kodak and especially Jennifer and Tina who are working with me. Very cool news Drew! Congratulations. Can’t wait to see the videos of the Kayak trip. congratulations man, have a nice trip!!!! I’ve been working hard to connect with more camera manufacturers and brands that I like. My first digital camera (circa 1997) was a Kodak and I still have it. Ben, that’s really cool that Kodak sent you that stuff. Can’t wait to see how the videos turn out. I added a name and guessed at it based on the writers for the site. I also removed the link because you used a keyword in the comment. However you left me a real comment and I care about real people and real conversation. So thank you. My kayak has a kayak mount from Xshot. I bet if you wanted to you could attach an Xshot kayak mount to your board and use the cameras to get some great surfing shots. Its good dude. well i love photography and using Kodak. i request my brother in UK to send me same Kodak cam hope i will get it soon. Kodak was my first digital camera way back when, we still have that. 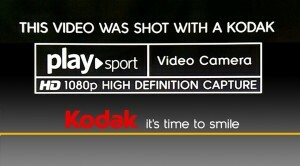 Kodak is a good brand for a camera. No wonder it is still being patronized now. Like the Kodak camera it gives the best results. Drew you had one great camera! Did you already posts some of your kayaking shots and videos? I bet they are pretty amazing. Me myself patronize kodak brands also even it’s software where you could easily edit your photos and quick print options.